Could the Earth-2149 Squirrel Girl destroy Colonel America's shield? On Earth-2149 - the Zombie universe - Colonel America's shield is made of a Vibranium-Steel alloy instead of pure Vibranium. Also, in that universe, Squirrel Girl's squirrels are as undead as everything else. This means that they feel no pain, and will not stop gnawing/clawing at something even after their teeth/claws physically rip out or break off. So... could Zombie Squirrel Girl make her zombie squirrels damage Colonel America's shield? In the Mohs scale of mineral hardness, teeth have a hardness of 5, where as steel has a hardness between 4 to 4.5. So the teeth are slightly harder. If the shield were made only of steel, the zombie squirrels could scratch it. Given enough scratches (like, a bajillion), they should be able to eventually bore a hole through it. I think it is fair to assume that vibranium is at least as hard as titanium. With a hardness of 6, titanium is safe from zombie squirrels. Since his shield has the ultra resilient vibranium in it; it is unlikely the zombie squirrels can scratch it. Their teeth, bones, and everything else would wear away long before the shield showed even a scratch. On the other hand. 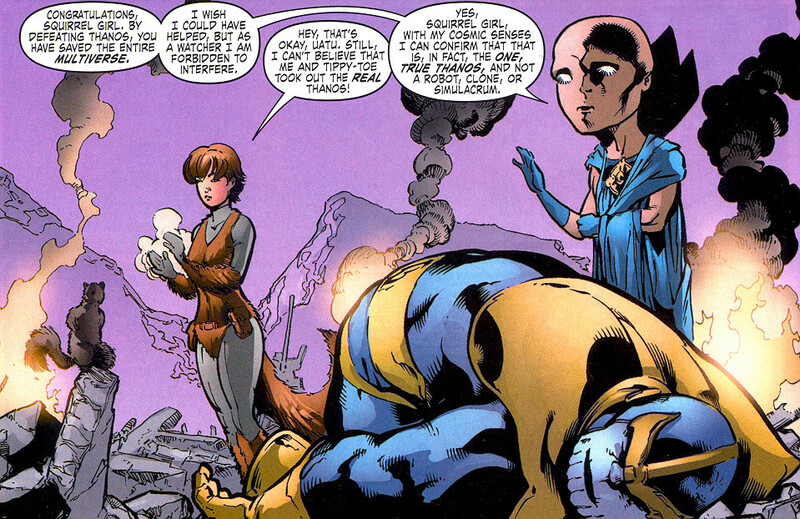 You have to consider that Squirrel Girl took out Thanos. 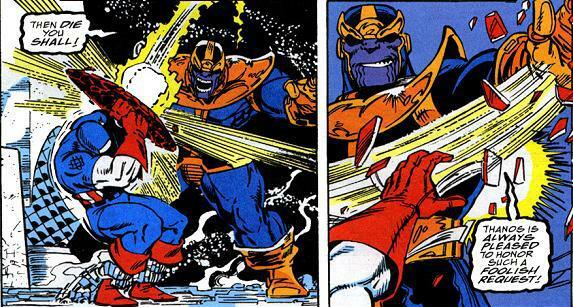 And Thanos shattered Captain America's shield. So what we have here is a classic paper/rock/scissors scenario. Squirrel Girl beats Thanos, Thanos beats Captain America's shield, Captain America beats Squirrel Girl. I'm going to go with absolutely no. 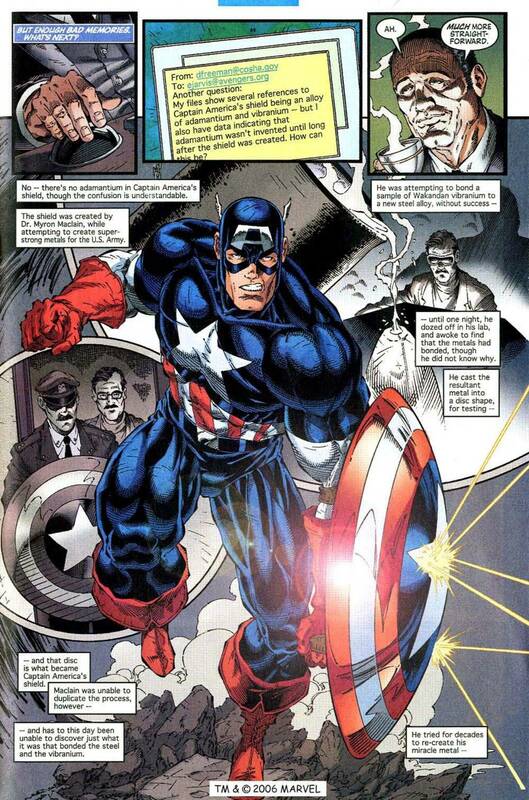 It's been established that Captain America's shield is in fact made of an alloy of Steel and Vibranium in other universes as well, including the main continuity universe where is has been proven to be utterly impenetrable to all but the most alpha of mutant/godly powers. Although Squirrel Girl's little evil buddies may have near-infinite patience, it's unlikely they can make a dent in a shield that has utterly shrugged off (without a scratch) impacts from Mjolnir, punches from the Hulk and about a gazillion bullet-strikes. 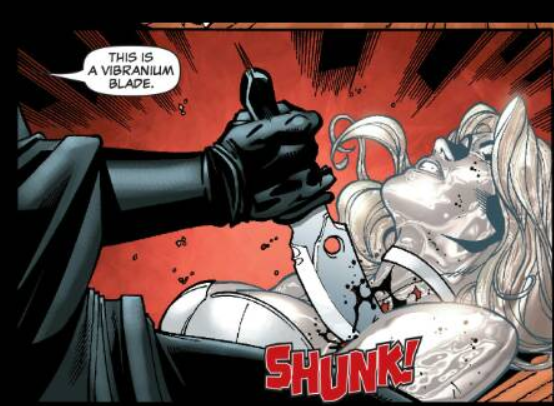 Well pure Vibranium can pierce the diamond skin of Emma Frost. Since the shield is a vibranium alloy, it'll shatter Squirrel Girl's teeth. Not the answer you're looking for? Browse other questions tagged marvel captain-america vibranium squirrel-girl or ask your own question. How did Squirrel Girl defeat Dr Doom? How was the Proto-Adamantium in Captain America's shield forged? Why could Squirrel Girl access the Iron Man suit? Why are there two #1s of The Unbeatable Squirrel Girl less than a year apart? If vibranium is the strongest metal on earth, then why did Captain America's shield dent when Peggy Carter shot it? Could Hela destroy Captain America's shield? Does Squirrel Girl have maxed power stats on the Marvel Wiki?